See that table o’ cosmetics? 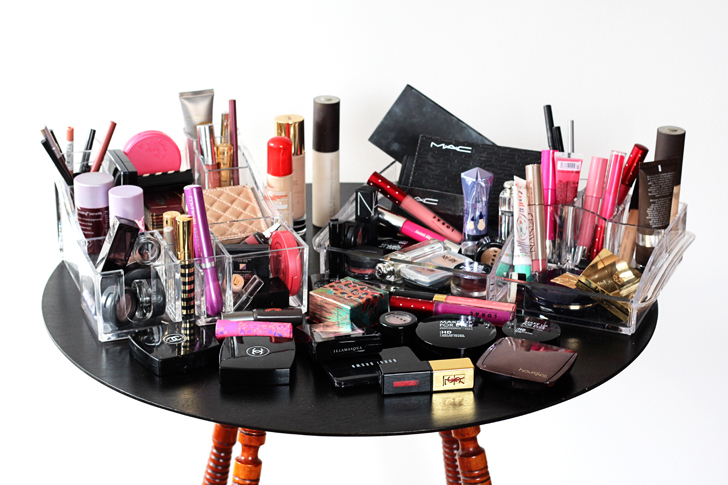 That’s my current makeup collection. The funny/sad thing? I got rid of tons before moving this summer, so this is my paired down collection. However, starting this month, I’m going through each and every product, pinpointing each ingredient, and researching the toxicity. I AM ON A MISSION. I have a sneaking suspicion my collection will be quite whittled down in the near future. My big issue is that a lot of the natural makeup brands don’t make shades dark enough for women of color. I love Tarte’s eye makeup and blush but their face makeup won’t work. I had high hopes for Bare Minerals’ new foundation and it was WAY off. The struggle is real. Great point, HB. If I come across a brand with a good range of shades, you’ll be the first to know. Before I turned 40 (3 years ago), I always said I’d like to freeze time at 28- you’re not quite 30, and you’re almost out of your twenty-something(s). But when I turned 40?!?!?!? Forty is THE best. Something changes in your everything. Enjoy and embrace it. And from another Jen who also turned 40 three years ago (shout out for the most popular US girl’s name in the 1970s! ), it is the best. I started mountain biking when I was 40, and did some epic riding in British Columbia this fall. Wanted to do it in my 20s but never could / would have. Mineral fusion has a good range of make up colors. I think you might like the Think Dirty app. It’s a Canadian woman who developed it after her mother was diagnosed with cancer and she became curious as to the effects of personal care products on our health. What I liked about it was that it was an independent organization and not linked to any product manufacturers. Super simple to use, you scan a bar code and it gives you a rating based on toxicity and known carcenogens, neurotoxins, perfumes and allergens and other things. Well, I can tell that you’ll be dumping about 98 percent of that collection. It’s shocking how toxic all personal care products are in the States. I can recommend Juice Beauty for so much and Ilia for lipsticks. They are amazing. And Acure is great for face wash, oils and shampoo and conditioner and it’s also well priced. Have fun with your purge. It’s so exciting! Yep! Dumped about 60% so far…not even close to being done! I’m very excited to see all your research! I posted a few of my favorite Rose skincare products on my blog today, and none of them have a rating of the EWG. Anywhere else where I can find this info? i turn 41 in December. And other than wondering how that happened, I’m suddenly obsessed with taking care of my skin. Not obsessed enough to do the research you are doing but certainly enough to read your list! And I can’t wait. Thank you thank you thank you! I am looking forward to reading your research. I see a few products in that picture that I use as well. I use chantecaille and tarte for that very reason! Let me know if you find anything wrong with them. 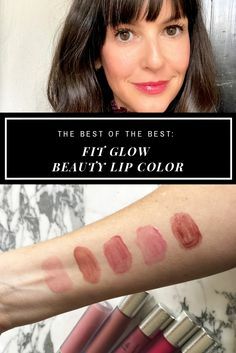 I’m a consultant with Beautycounter. I know that awhile back you rated out Tint Skin as one of your favorites. Do you know we now have a full color cosmetics line as well? The products are really amazing (and I am a total product junkie as well) and we have done all the work for you. Safe. Beautiful. Effective. I hope you check them out too! And if you’re in Boston, hit up Follain. It’s a story selling only environmentally healthy, luxury brands. It’s a beautiful shop! Not in the makeup category, but…Weleda – I love their sensitive skin almond line of products, especially the face cream, perfect weight for dry winter air (3 cheers for being back in winterland!). Also, when I purged a few years ago using the same database, I noticed the key ingredient in so many face lotions was glycerin. It rates a zero in the database, so in the winter, I often just straight-up moisturize with glycerin or mix it with the Weleda moisturizer to add an extra layer between my face & winter air. It’s inexpensive, too. And then I take myself out to lunch with the money that I saved. Or roll around with the extra cash. Everything is toxic in certain quantities. Sorry, “toxic” is a pet peeve of mine. You may want to look into co-morbidity. I’d start with the link below as a good reference. I work in the field of environmental toxicology so feel free to email me if some things don’t make sense. There is a lovely store in downtown Laguna that specializes in non-toxic cosmetics. If you happen to be in the area again, it’s called Roots:The Beauty Underground. The owner recommended RMS Beauty for concealer and highlighter. And Vapour Organic Beauty for foundation. I have found both to be quite wonderful and moisturizing. Best of luck. Been there many times…love Laura! Always love your reviews…4-0 is nothing…45 was harder. That’s when the eyes started going and the wrinkles REALLY started appearing.